Evick never step into heavy metal territory, nor do they even often venture into hard rock territory. But the band, who cite as influences such varied artists as KISS, Van Halen, Bruce Springsteen and John Cougar Mellencamp, are a solid rock outfit whose sound will appeal to the obviously very different fans of the above artists and those like them. The songs on "Anachronism" range from the slow, sensitive ballad, "Unconditional," to stronger rockers like the first cut, "Dance." That's a big range, too. "Dance" sounds like modern L.A. Guns while "Uncoditional" sounds like one of those ballads that KISS had such success with (i.e., "Forever"). 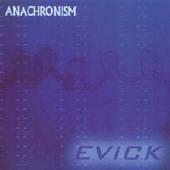 Evick perform the rockers with as much expertise as the slower tunes, pouring gobs of everyman emotion into each piece. Most of the lyrics are little swatches of blue collar life filled with a tangible optimism and hope. It all works. All in all, Evick is closer to Springsteen/Mellencamp than KISS/Van Halen, but it all works well and is unusually easy to relate to. Evick: Pete, Chuck, Kyle, Dan, Ed. For more information, check out http://www.evick.com.